I would like to share this lovely little book with those of you interested in watercolor. I usually keep the books that I am reviewing in a stack. This one I kept upright in front of me on my desk for several weeks. I just loved looking at it. It made me happy. This would be a great coffee table book to inspire creative energy.I simply really enjoyed every minute I looked at it. I do not know much about watercolor. Every thing that I have learned has been trial and error. 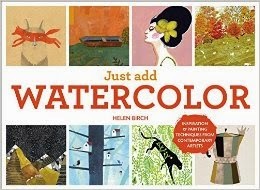 This book is full of tidbits to push you on to watercolor success. Of course, the gorgeous little book is filled with paintings. If you are like me, those inspire and make you want to try them out. Pick it up and try it out. I am going to try a few techniques over summer. Follow me on Instagram to see what I come up with. This could easily be a book that you would buy simply for art appreciation. This book was graciously provided by Crown Publishing so that I could share it with you.